I’ve been reading and analysing so much these days that my brain feels like mush sometimes. Of course I do enjoy my work but *ahem*, certain subjects can be such a chore. All of a sudden while reading and answering questions to do with Singapore propaganda ( can you believe the govt still tries to do this to us under the guise of school work?) and feeling extremely annoyed by the huge stacks of readings (as if I don’t already have enough) about all the good stuff about our country, I remembered something that me and my friends made a few weeks back. 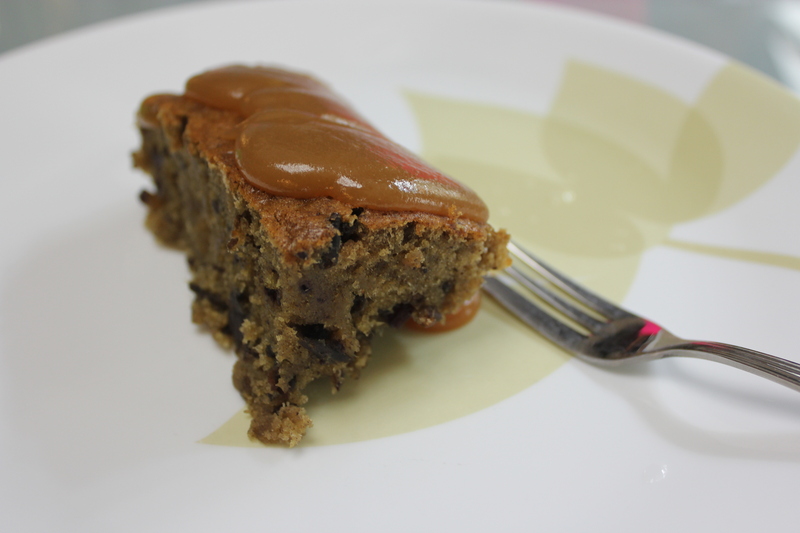 Sticky date pudding with caramel sauce, moist and sticky in every sense of the word. Reduce the sugar in the pudding though, liberally (unless you like it real sweet) because the dates are already sweet enough. Don’t say I didn’t warn you! 2. Coarsely chop dates and simmer it in water in a deep saucepan, uncovered for 5 mins. Remove pan from heat and stir in baking soda ( it’ll start to foam). Let mizture stand for 20 minutes. You will expect a jam-like consistency. 3. Stir the dry ingredients together and sift them into a bowl. 7. spoon batter into baking pan, and set pan in a larger baking pan ( I used an aluminium foil tray) Add enough Hot water to the larger pan till it reaches halfway up the sides of the smaller pan and bake in the middle of the oven until a tester comes out clean. It takes 35-40 minutes. Bake longer if you like your pudding less moist. 3. Simmer sauce, stirring occasionally until thickened slightly ( 5 mins). A very very decadent dessert but it definitely satisfied the sweet tooth!